the hotel de crillon in paris july 1979 was madness. denis piel’s couture debut. gia’s first paris collections sitting for american vogue and one of the most talked about shows of the decade, yves saint laurent’s picasso collection. denis announced he would shoot the collections in available daylight ONLY. the couture houses needed the clothes during the day so they could be sold. denis also required the two little harlequin boys from saint laurent’s show. he wanted special armchairs and couches and an hermes pigskin agenda, nothing else. the pictures were a huge success. the star was a photo of gia in a lace evening dress, lying down with the two boys, holding bouquets of flowers. yves saint laurent later used the picture for his own book as the shot that summed up the collection. 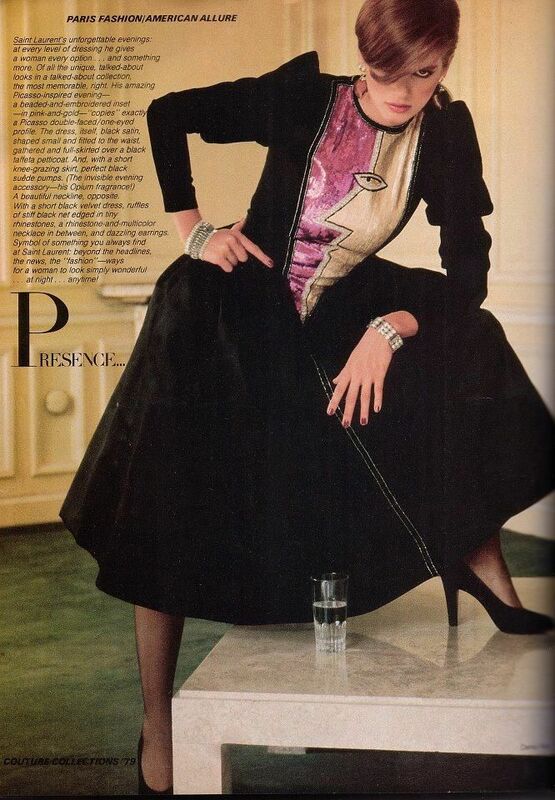 american vogue used 12 shots of gia in all.